The unrelentingly intense Captain Phillips is a showcase of acting and storytelling. Based on events collected in a memoir, regardless of how true or untrue they may be, Paul Greengrass’ film is another example of the director’s frequency in crafting atmospheric movies about ordinary people thrust into extraordinary situations, and doing it very well. 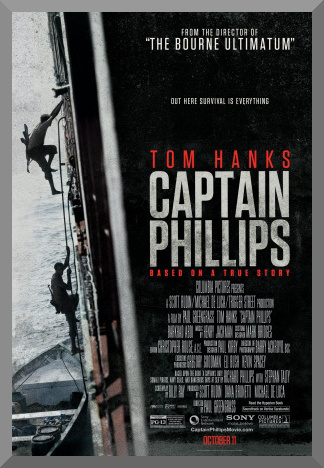 Tom Hanks is at his finest as Richard Phillips, who was captaining the cargo ship Maersk Alabama when it was hijacked by Somali pirates in April 2009, by a team led by Abduwali Muse (Barkhad Abdi). They had been warned about this, now was the time to act. The rest of the crew is hidden in the depths of the engine rooms. He’s able to hold them off for a little while. Muse wants millions of dollars, but the ship only holds packaged food and $30,000. No matter. They force Phillips into a lifeboat and they’re off. During the nightmarish period that follows, the U.S. Navy becomes increasingly aware of what’s going on, and the film concludes during a desperate attempt at a rescue. This is a very good movie. Not only is Hanks excellent, Barkhad Abdi gives a brilliant performance, certainly worthy of his Oscar nomination. Greengrass’ cinéma vérité style sometimes does give a convincing mood, but the shaky-cam method is occasionally done to excess and threatens temporary incoherency. However, such incidents are rare. Barry Ackroyd does a much better and cohesive job here as a cinematographer than he did on Parkland. The mood of the film is precise. It’s restless. It’s exhausting. It’s draining. Normally, these adjectives would be applied negatively, but when describing a film about a hostage situation, such ideas are no less than absolutely required. Captain Phillips perfectly meets these descriptors. We know how the story ends before going in, but there are true moments of mortality realized within the confines of the picture. The last scene features some of the greatest acting I’ve seen in a while. Captain Phillips doesn’t push any politics. It would have been astoundingly easy to turn this into a jingoistic and sickening product, but this never happens. This is not a tired and failed depiction of misplaced and misportrayed patriotism that trips so many other stories of the like. There’s a heavily promoted scene that occurs during the initial hijacking, where Muse pulls Phillips aside and says “I’m the captain now.” Truly this event had been building up for some time before. There was a shot inserted earlier when both men look at each other through binoculars as the Somali speedboat approaches the Maersk Alabama. All of this leads to one fair conclusion that Greengrass accurately portrays: It’s force against force, man against man, captor against hostage. This also makes the film ultimately more compelling. You’re probably going to feel pretty tired when Captain Phillips’ 134 minute runtime draws to a close. You have just played witness to an incredible display of cinematic craft. You will have seen something worthwhile, something poignant, something brave. Push aside the accusations of inaccuracies – this is a movie, and a great one at that. What the exact truth is as to what happened in what order at the behest of whom on the Alabama is in doubt, but I had the privilege of pre-screening the film wth hundreds of Maersk employees (many of whom were support staff that day and are friends with the captain and crew) in October. I’ll tell you that there was a lot of skepticism in that room before the film started about glamorization, etc. When it was over there wasn’t wild applause or raucous fist pumping. These are largely ex-military personnel. But there was a lot of hand shaking, nodding and a feeling that justice was done to the spirit of the event. If that crowd thought it was on target, tonally at the very least, I think Greengrass did his job.